Iris Murdoch’s The Time of the Angels (1966) features not one but two clerical characters, both of the Church of England, and amongst the principal characters to boot. A little while ago I introduced the physical setting in which Murdoch’s drama is played out: the vicarage of a ruined church in a London wasteland, blanketed in snow and shrouded in the twilight of a London fog. It is against this backdrop of isolation and purposelessness that Murdoch is able to dramatise the impact of the ‘Death of God’ theology of the 1960s. The blitzed church of St Dunstan in the East, now a public garden. There are two Fisher brothers: Marcus, and his elder brother Carel, the rector of St Eustace Watergate. Marcus has become concerned about his brother, living as a recluse in the rectory and refusing all callers, including Marcus. He is concerned not only for Carel, but also for Carel’s daughter Muriel, and for Elizabeth, to whom Marcus and Carel are guardians. He is also concerned on his own account. Marcus, a schoolteacher, is writing a book, Morality in a World without God (chapter 7), which will ‘rescue the idea of an Absolute in morals by showing it to be implied in the most unavoidable human activity of moral evaluation’. Thus armed, no longer would either theological metaphor or crude existentialism be necessary in order to society to function. But somehow he is distracted by the thought of his brother. Marcus’ friend Norah has her doubts about the book, and Marcus’ intentions in writing it (chapter 2). Despite his apparent wish to start afresh, Marcus’ favourite reading is still works of theology; for Norah, Marcus is ‘just a Christian fellow-traveller. It’s better not to tinker with a dying mythology.’ The sooner the West would pass through its current twilight of the gods, the better, Norah thought. Her aim, characteristic of ‘the brisk sensibleness of an old Fabian radical’ was to get all that out of the system. Concerned about Carel’s state of mind, Norah and Marcus consult with his bishop (chapter 9). Murdoch does not name him, but the parallel is very clearly with John Robinson, bishop of Woolwich, whose 1963 book Honest to God was perhaps the last theological bestseller in British history, for which he was censured by Michael Ramsey, archbishop of Canterbury. Both Norah and Marcus press the bishop on Carel’s apparent lack of belief, while he tucks into their treacle tart, washing it down with their claret. ‘It is a time’ he says ‘when, as one might put it, mankind is growing up. … Much of the symbolism of theology … is, in this scientific age, simply a barrier to belief. Our symbolism must change.’ As for Carel, the key is not his beliefs, but ‘passion, Kierkegaard said, didn’t he, passion. That’s the necessary truth.’ For the so-called ‘South Bank Religion’, what one believed was not so important as the earnestness with which one believed it. Despite his confession of atheism, the bishop regards Carel as ‘a profoundly religious man’. I don’t want to write too much here about Carel himself, since to do so could very easily spoil the plot for anyone who has not read the book. But his character, and his actions, are the dark counterpart to both Marcus and the bishop. Marcus is superficially sure that his project of morality without the supernatural can be achieved. The bishop seems content enough that the church can survive the kind of testing and purification that the current ‘interregnum’ (Norah’s twilight of the gods) will entail. Carel, and the suffocating darkness that seems to emanate from him and damage those around him, is the side of their argument that neither can contemplate. Murdoch shows us the abyss of meaninglessness that may be glimpsed but cannot be faced. What did modern theology look like in the Sixties ? What did modern theology look like ? 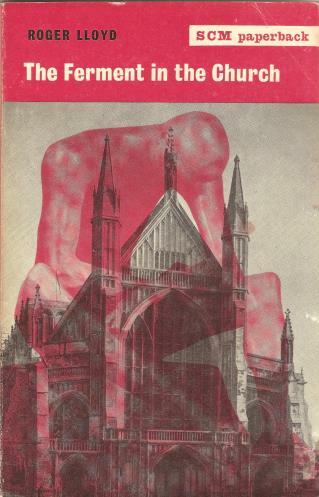 An odd question perhaps; but I’d like to look at some of the cover designs of books of theology aimed at a popular readership between 1963 and 1970. This is no exhaustive study (being based mostly on the books on my own shelves), but it would seem that at least some of those responsible for publicising the ‘Death of God’ theology thought there was a connection between it and modern art. Undoubtedly the most famous such book of the period was John A.T. Robinson’s Honest to God, published by the SCM Press in 1963, in its series of cheap pocket paperbacks. 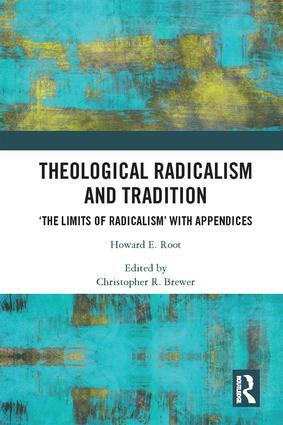 Its cover is a minor masterpiece of cover design, showing a young man deep in thought, wrestling perhaps with precisely the kind of radical rethinking of his religion that Robinson was proposing. Image and message seem to be in perfect interplay. Interestingly, the image is of a rather older work, and from a different context. ‘Seated Youth’ (1918) is by the German sculptor Wilhelm Lehmbruck, and Lehmbruck’s experience of working in a wartime field hospital is translated between nations and over time to become a symbol of a more spiritual crisis. After Honest to God, ‘Seated Youth’ seems to have become iconic of Robinson’s book, such that it appears again on a follow-up book from Roger Lloyd, The Ferment in the Church, published in 1964, also by SCM. This time the sculpture is overlaid on a background of Winchester Cathedral, signifying the clash of old and new. I must stress again that this post captures an impression, and is not based on a systematic study. As such, there isn’t much in the way of a control group – of works of more mainstream theology published for a mass market, for which the economics of a cover design with an image added up. 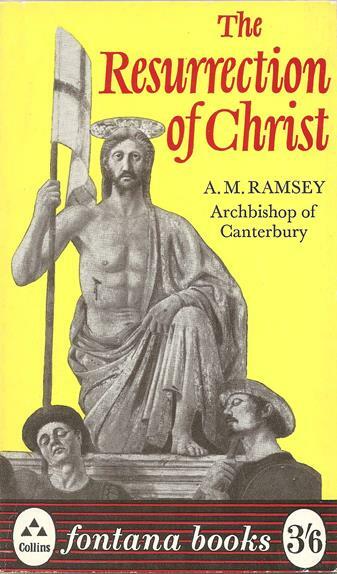 But there were some, such as Michael Ramsey’s The Resurrection of Christ, first published in 1945 but reissued by Collins in the Fontana imprint. The impression here is the fourth, from 1966, and whilst it too uses a work of art, Collins’ designer opted for an unidentified work in a much older style. This perhaps matched Ramsey’s work, which was by no means conservative in the broader scheme of things, but looked to be so when set against Robinson. There was one artist who seemed to appear often, and that was Jacob Epstein. 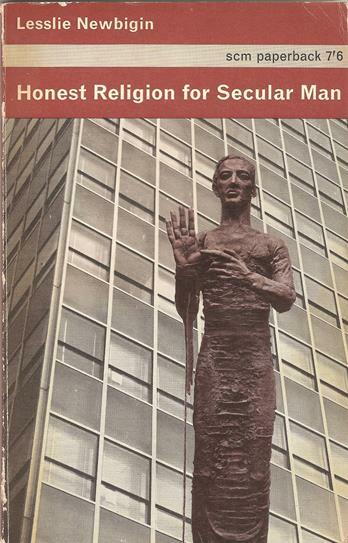 Lesslie Newbigin’s Honest Religion for Secular Man (SCM, 1966) featured ‘Risen Christ’, a work made between 1917-19 and, like ‘Seated Youth’, an imaginative product of the First World War. A sepulchral Christ shows the viewer his wounds, against the backdrop of the type of multi-storey office building in vogue at the time, although the particular building is not identified. Modern Man needed to work out the appropriate response to the call of God in a secular, “technological” environment. All three SCM titles I’ve discussed so far were in the same series; but other publishers were not slow to see the connection, and at about the same time. 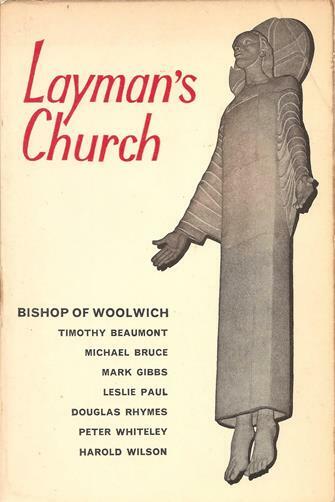 In the same year as Honest to God, the Lutterworth Press published Layman’s Church, a collection of essays introduced by Timothy (later Lord) Beaumont, and including essays from several of the figures associated with ‘South Bank religion’, including Robinson. Its cover features Epstein’s ‘Christ in Majesty’, made for Llandaff cathedral in 1954-5. 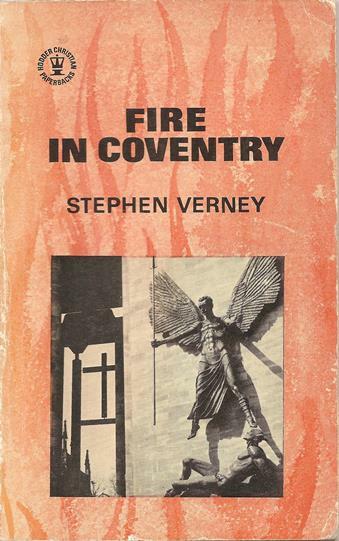 The new Coventry cathedral has on the exterior of its porch Epstein’s ‘St Michael and the Devil’ (1956-8), featured on Stephen Verney’s Fire in Coventry (Hodder, 1963). So it would seem that publishers of popular theology in the early Sixties thought there was a connection between the kind of modern theology that seemed to be leading the market and the kind of modern sculpture (and it is mostly sculpture) that was finding its way into churches. Or, at the very least, those publishers thought that their likely readers would find the designs meaningful. I doubt I will have the time to pursue this idea any more systematically; but there’s a great Ph.D. subject in here for someone. 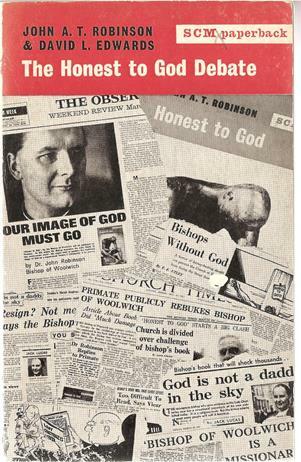 The public furore over John Robinson’s Honest to God is perhaps the single most well-known public theological event of the 1960s, and perhaps even of the twentieth century. 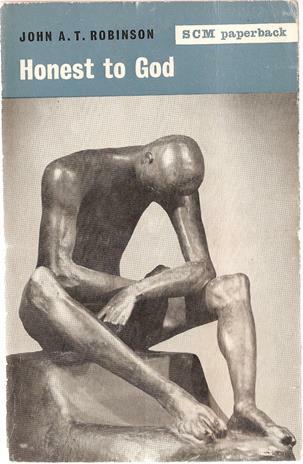 The book appeared in 1963, in the now iconic series of slim pocket paperbacks from the SCM Press, with on its cover a modern sculpture of a earnest young man in thought: Modern Man grappling with the challenges of ‘religionless’ Christianity in a time of crisis. To focus too closely on whether Robinson was right or wrong, a prophet of a credible young church or a destroyer from within, is to miss some important wider questions. The central issue for Michael Ramsey was the limits of doctrine in the Church of England, and the means of setting them. Recent commentators have divided over the subject. For Edward Norman, the church was, and is, bound to repeat such incidents, since it is without any central means of defining doctrine and accommodating its development. For others, George Carey amongst them, such episodes rather show the elasticity of the Anglican polity, in which the very absence of a rigid central curia holds open a safe space for such theological adventure. Feelings were running high; and Ramsey learned of an intention to have the book and its orthodoxy debated in the Convocation of Canterbury. Mervyn Stockwood, bishop of Southwark, feared a petition from within the diocese for proceedings against Robinson in Stockwood’s own court. There appeared to be a real threat of what would be widely viewed in the media as a heresy hunt, and in two forums neither of which were well constituted to do the job. This was to be avoided at all costs. Yet Ramsey needed to do something. Try as he might, he could not see how Robinson, despite his protestations, had stayed within the field of historic orthodoxy, even allowing for the apparent cloudiness of some of Robinson’s writing. He told the bishops that the book ‘removes the conception of God known to us in the Bible and the Creed, and while some sort of doctrine about God and the Deity of Christ emerges, it is impossible to identify this doctrine with the doctrine of our Church which as Bishops we have promised to uphold.’ Conservatives were always ready to remind him of this consecration vow to ‘drive away strange and erroneous doctrine’, and so Ramsey needed to act, and quickly, using the only tool available to him: his own personal authority. Ramsey gave a television interview, stating that Robinson had been ‘utterly wrong and misleading to denounce the imagery of God held by Christian men, women and children […] and to say that we can’t have any new thought until it is swept away.’ The statement was short, and blunt, and provoked Robinson to protest; but Ramsey was at the time also writing the pamphlet that was to be published three weeks later as Image Old and New; an attempt not at debunking so much as to show that the Church was prepared to engage with the issues whilst at the same time emphasising the necessary limits. Finally there was still the matter of an heresy hunt in the Convocation, and ‘with great reluctance’ but some success Ramsey used part of his presidential address to meet the point. To what extent could Ramsey have handled the affair differently ? He later acknowledged that there had been ‘in the background a widespread crisis of faith which cried out for another kind of spirit in meeting it.’ Perhaps Ramsey was not quite engaged with some of the theological currents with which Robinson’s mind was flowing; they were certainly not those he found most congenial. That said, Image Old and New shows a quite sufficient grasp of the main issues for the needs of an archbishop, if not indeed of a professional theologian, and neither had Ramsey come to them anew in 1963. Ramsey certainly regretted the pastoral damage done to his relationships with both Robinson and Stockwood. The correspondence with Robinson is amongst the most painful in the Ramsey Papers, and his chaplain thought he had never seen Ramsey so upset. And it was perhaps in the church’s pastoral role that Ramsey was caught behind the pace. Ramsey was well aware of the estrangement of much of the public from a church guilty of ‘assuming too easily that the faith may be taken for granted and needs only to be stated and commended.’ But such commendation was only possible if ‘we go out and put ourselves with loving sympathy inside the doubts of the doubting, the questions of the questioners, and the loneliness of those who have lost their way.’ In the case of Honest to God, however, he was slow to grasp the depth of that estrangement. The testimonies brought together in the later The Honest to God Debate clearly show that Robinson had touched a great many people, and to the quick, and it was this that Ramsey was slow to appreciate. Ultimately, however, Ramsey had no choice. For all the comfort and relief that the book had brought to some, it had also caused acute distress to others. A priest in Ramsey’s former diocese of Durham felt that the ground had been cut from beneath the ordinary parish clergy, facing questions from their flock which they could not answer: ‘what are we poor priests to do ?’ If there was a pastoral need to meet the doubts of the doubting, it was to be balanced with a responsibility to the existing faithful. More fundamentally, Ramsey’s hands were tied by his responsibility to the integrity of the Church of England as a whole. There had to be something, however small, that distinguished a church from a voluntary society for the discussion of religious opinions; and that something was fixity in doctrine at its core. Just months before the storm broke, Ramsey spoke of ‘the hard adventure of blending depth of conviction with the utmost reverence for the mind and conscience of other people’. The church had a difficult double role, of ‘encouraging freedom of enquiry and adhering to a definite faith revealed in Holy Scripture and summarized in the historic creeds.’ In a phrase of Mandell Creighton, there was a need to balance ‘“the right of the individual to be free and the duty of the institution to be something.”’ Once Ramsey had been convinced that Robinson, however unwittingly and however well intentioned, had subtracted from that essential something, then there was no option than to act.